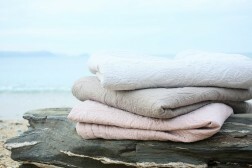 We love love love these beautiful French quilts! Available in Powder Pink, Powder Blue and Earth, and with a matching cushion cover included in the price, these gorgeous robust quilts are ideal for indoor or outdoor use. Use these enormous super king size quilts as a cosy bedspread in the winter and a fabulous picnic blanket in the summer. Machine washable Super King Size quilt, available in Powder Pink, Powder Blue and Earth, with a matching cushion cover included in the price.